Whether you’re a newly married couple or a bachelor enjoying having your own space, nothing beats the feeling of being totally independent, starting a new chapter and taking control of your life. Moving into your own place is also never fully complete without having your own backyard grill to be the barbecue master for your own get togethers. For anyone just starting out with grilling with limited space, a basic gas grill with 2 burners is a great fit. Some apartments may not entirely allow use of a full-size grill, if that is the case, you may want to consider checking the selections of the best portable or tabletop gas grills. But when possible, we recommend cooking on a full-size grill to get the best experience and value from your purchase. 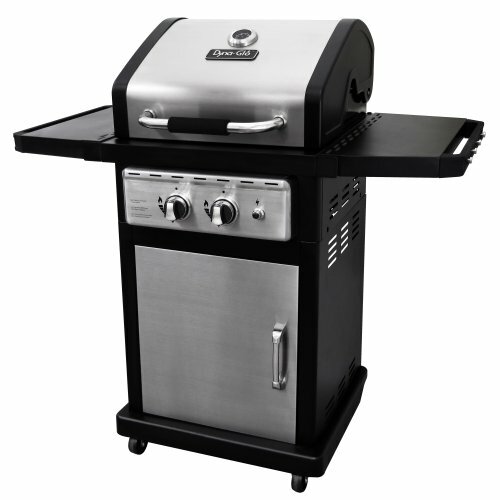 So without further ado, I give you the list of the best 2 burner gas grills on the market. The body of the Weber Spirit S210 is made up of thick steel and also has some stainless steel parts, so it really has a sturdy construction that will last for years, not just for 1 or 2 seasons. The parts fit perfectly so assembly is quick and easy and its finish feels amazing. The Spirit offers ample space to grill with 360 square inches of cooking space and a 90 square inch warming area. It is also designed to include six tool hooks, two heavy-duty front-locking casters, and two heavy-duty back swivel casters so it can easily be moved around. It comes with a 10-foot flexible hose for easy hook-up so overall, it is a complete, well-designed package. Performance is also superb, it heats up fast and reaches a high temperature of 525 degrees without a problem. Although its BTU is slightly lower for its size, it still does a solid job of searing your steaks and even adding more intense flavor to your meat with its included tool of Flavorizer bar. With a star user rating of 4.6 out of 5 stars on Amazon, you know this grill is a user favorite. 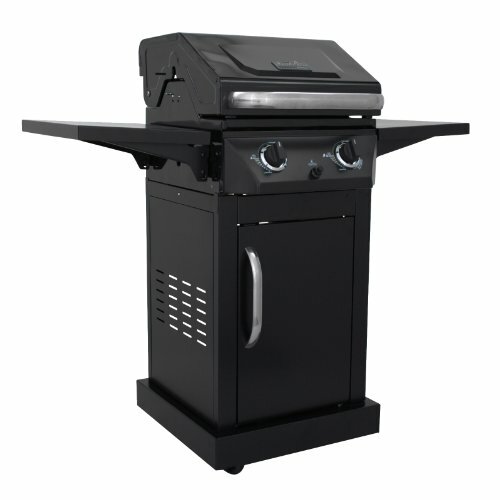 What’s especially great about this unit that makes it stand out from the other Weber 2 burner gas grill is its capability to convert for a natural gas fuel. Natural gas grills usually only come in the larger sizes and generally cost significantly more, but with this model, there is only a small difference of around 20 bucks to have the natural gas capability, so it’s an easy choice to have the natural alternative add-on! The natural unit of the Weber Spirit S210 costs around $570, but you can find even better deals, as low as $470 on Amazon. The liquid propane-only grill is valued approximately at $450 and can be purchased for this price on Amazon. With that said, the Weber Spirit E-210 should also be close to the top of your 2 burner grill list. It has a similar set of features and design to the S210, but has different metal parts used in construction and only runs with liquid propane. It can also save you an additional $150 so it is a good alternative if you are on a budget. We even featured the E-210 in the best small gas grills, so if you are interested, you might want to read our other review about it. If you are seeking a grill with side burner, you can also check out the slightly larger Weber Spirit E220, it is similar and has a few upgrades to E210 and S-210, like the additional side burner. Although Weber makes it hard for its competitors to gain the coveted top spot for any grill category, the competition for the best 2 burner gas grills is far from over. In fact, Dyna-Glo Smart Space Living is a pretty close second and a solid alternative to the Weber spirit. Dyna-Glo is making a name for gas grills and its Smart Space Saving model is a really popular choice among individuals looking to own a full height gas grill that is still compact. The Smart Space has some of the most compact dimensions for this category. And even with it’s more petite size, it has plenty of cooking space, totaling up to 547 square inches, with 350 square inches for the primary cooking area and 197 square inches for warming. It is perfectly sized for a small family or gathering. The heat capacity is also amazing, heat distribution is efficient for its cooking size and it heats even higher than the Weber Spirit mentioned previously. With a price of just $290, the Smart Space from Dyna-Glo offers great value for your money. You can also score this little powerhouse for a great discount on Amazon. It also received a high user rating of 4.6 out of 5 stars, making it a solid favorite among consumers. This unit has also been featured among our best gas grills under 500 dollars which you can also read here. Not far behind in the competition, the Char Broil Classic 300 also has some great competitive features at an even lower price point. Like the Dyna-Glo, Char Broil gas grills are also gaining recognition, mostly because of their low prices and easy availability. 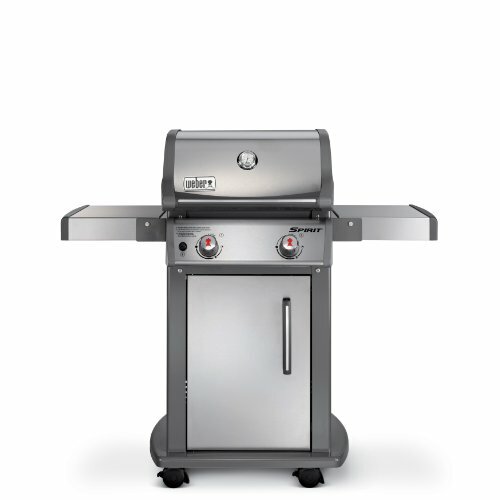 The overall construction and design of the Classic 300 is pretty similar to both the Dyna-Glo Smart Space and the Weber Spirit gas grills. Like the others, it is also built with a single door and comes with metal side shelves. Its side tables can fold down making it really compact and easier to store. Although it is not rust proof, its overall construction, made up of porcelain-coated steel, is pretty durable that can last for a solid two seasons or several years if handled with proper care and maintenance. It has smaller cooking area of 300 square inches, compared to the others, but it is still large enough for you to serve food for a small group of people. You may not be able to cook for a crowd and load up with tons of meat all at the same time, but cook time will not be long. The Classic’s heat output is equivalent to the capacity of the Dyna-Glo, so it also heats up high quickly without difficulty. You can expect solid quality and have all the functions you can get from cooking with a basic grill. The Classic has 2 burners, side tables, capable heat output and an electronic ignition for faster lighting. Overall, it also got a satisfactory user star rating of 4.2 out of 5 on Amazon. You can score this frill for just $161 on Amazon as of this writing.